Luxury retail is getting its kit on for the environment. Online fashion enclave Net-a-Porter has collaborated with five elite British designers on an exclusive capsule collection in support of the Green Carpet Challenge, an initiative founded by Livia Firth, creative director of boutique-turned-consultancy Eco Age and wife of Oscar-winning actor Colin Firth, to dress A-listed in sustainable fashion on the Hollywood awards circuit. The 10-piece lineup, which features designs by Christopher Bailey, Victoria Beckham, Christopher Kane, Erdem, and Roland Mouret, has "embraced sustainable style...in accordance with GCC ethical criteria and produced to the highest sustainable standards," according to a statement. Firth, Vogue editrix Anna Wintour, and Net-a-Porter’s Natalie Massanet, who currently chairs the British Fashion Council, unveiled the collection at an exclusive event at London Fashion Week a day ahead of its launch on Tuesday. Twenty percent of the proceeds will benefit (Red), a charity that finances Global Fund projects that help eliminate mother-to-child transmission of HIV in Africa. 20 percent of the collection’s proceeds will benefit (Red), which finances projects that help eliminate mother-to-child transmission of HIV in Africa. The designers employed planet-friendly materials like Oeko-Tex-certified French lace, tulle, and silk; Newlife fabric derived from post-consumer recycled plastic bottles; traceable wool yarn from Australia; and lead-free Swarovski crystals. That’s not all the eco-schmoozing these bold-faced names did. On Saturday, Firth joined Wintour, Massanet, and former Karl Lagerfeld muse Amanda Harlech for the premiere of Handprint at the W London hotel in Leicester Square. Directed by Mary Nighy, daughter of actor Bill Nighy, and starring actress-model (and Isabella Rossellini progeny) Elettra Wiedemann, the film aims to promote awareness of the conditions endured by garment workers in the third world. Bow-embellished satin dress ($2,795), made from Newlife fabric, by Christopher Bailey for Burberry Prorsum. Cut-out lace gown ($4,795), made of Oeko-Tex-certified silk, by Christopher Bailey for Burberry Prorsum. Swarovski crystal-embellished silk-satin halter-neck dress ($2,110) by Christopher Kane. Swarovski crystal-embellished silk-satin gown ($2,695) by Christopher Kane. Washed-silk and wool-crepe gown ($4,300) by Victoria Beckham. Tulle and wool-crepe dress ($2,895) by Victoria Beckham. Pavo silk-marocain gown ($4,110) by Roland Mouret. Agena silk-marocain jumpsuit ($3,475) by Roland Mouret. "Mildred" embroidered silk-blend gown ($7,450) by Erdem. 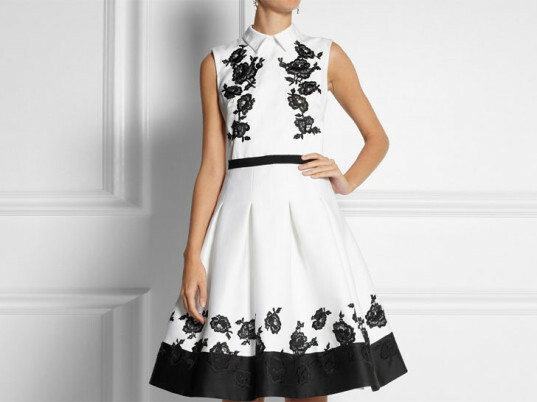 "Macey" embroidered duchesse-satin dress ($5,695) by Erdem. Christopher Bailey for Burberry Prorsum.